Looking from a rock ledge over a lake in Killarney Provincial Park in Ontario, Canada. 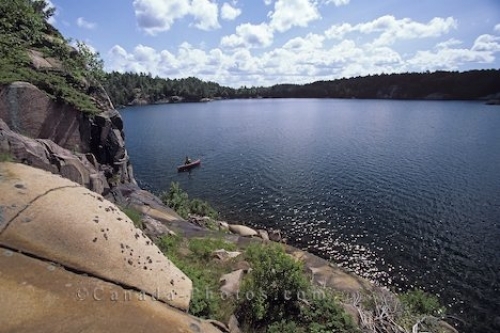 A canoeist paddles on a lake in the serenity of Killarney Provincial Park in Ontario, Canada. The park is surrounded by lakes, forests and quartzite rock cliffs where tourists love to spend time camping, hiking, swimming and fishing in the summer and throughout the winter partake in snowshoeing and skiing. Picture of a lake in Killarney Provincial Park in Ontario, Canada.